Need more shade for your home? 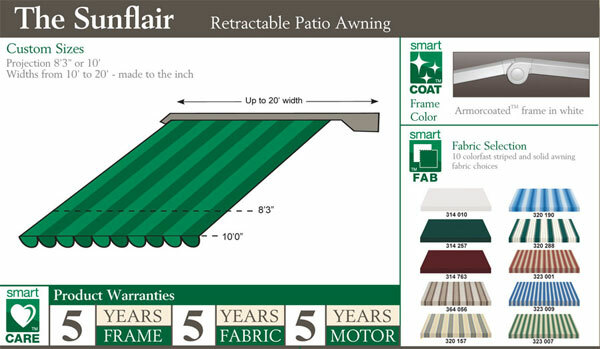 If yes, you should consider the Sunflair Economy Retractable Awning. This kind of retractable is created with flawless craftsmanship to emphasize the beauty of your home while increasing your home value. The Sunflair Economy is easy to operate with its wireless motor operation. All you have to do is use the wireless remote controls to automatically sensor your retractable patio awning to give more or less shade. The Sunflair fabric is also able to block sunrays while allowing you to take in your beautiful landscape view. But best of all it can save up to 25 percent of your energy costs. This quality awning includes an exceptional product warranty as well: five year warranty on the frame, five year warranty on the fabric and five year warranty on the motor. Let Carroll Awning install your Sunflair Economy awning. Below you will see the variety fabric selections you can choose. Get your custom made shade installed today. To learn more details click here. We offer any type of retractable awnings you may need, the from freestanding canopies to compact domes. Choose fabrics in stripes, solids or patterns. All are suited for UV resistance.